Immigration reform? By executive action? The thing Asian Americans have talked about for nearly a year now? According to media reports, the plan would provide deportation relief for up to 5 million people. It would expand Deferred Action for Childhood Arrivals (DACA), the program for DREAMers, that could make many more people eligible by changing the cutoff date to 2010 and eliminating the age limit on individuals. And undocumented parents of children who are citizens or legal residents may be able to get work permits. The proposal still wouldn’t include the family unity items Asian Americans want, like a speedier process for bringing relatives to the U.S. But there could be new tech visas in the offing. And there’s talk about eliminating the mandatory fingerprinting program under Secure Communities, or S-Comm, that led to massive deportations of hundreds of thousands of immigrants since 2009. But the leak did act as a battle cry to the Tea Party regulars to gear up for the “executive action is amnesty and amnesty is unconstitutional” fight. When The New York Times finally got their leak on so they didn’t have to quote Fox, we knew that the truth was somewhere in between here and Asia, where the President chose to recover from the midterm elections. It does seem to be a good way to get away from it all, doesn’t it? 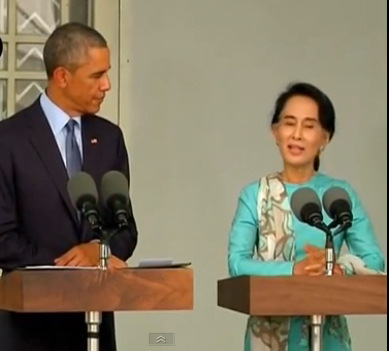 President Obama and Aung San Suu Kyi at joint press conference in Myanmar. That didn’t stop Tea Party House members from announcing there’s a Dec.12 deadline to fund the government and they’re looking to put a lump of coal in everyone’s stocking. Already Rep. Paul Gosar (R-AZ), Rep. Ted Yoho (R-FL) and Rep. Dave Brat (R-VA) (who beat Eric Cantor) are leading a charge to attach a rider blocking any immigration reform–or else. Shut down the government, of course. If the message of the low-turnout midterms was that voters want the politicians to start working toward solutions, apparently some didn’t get that memo. Asian Americans, however, are solidly for executive action on immigration, according to the multilingual exit poll of over 4,100 Asian American voters that was conducted by AALDEF in collaboration with 65 national and local community groups in 11 states. In response to the question “If Congress does not act on immigration reform, do you think President Obama should take his own executive actions on immigration?” 65% of Asian Americans polled said yes. So now we wait for the president to get back from Asia to formally announce details of the plan as soon as Friday. It could be the showdown that will ultimately define the Obama legacy. And if it doesn’t do that, it surely will provide us with another example of our country’s political dysfunction. It makes me nostalgic for the days when I worked for Congressman Norm Mineta, a moderate liberal Democrat, who’d call on his old friends, such as the late Congressman Henry Hyde, or the former Senator Alan Simpson. Working both sides of the aisle toward a solution wasn’t considered being a sellout. And compromise wasn’t considered a dirty word. “People are so afraid of compromise they are unable to deliver any results whatsoever for the American people,” said David Chiu, the President of the San Francisco Board of Supervisors and the newly elected California Assemblyman for District 17. 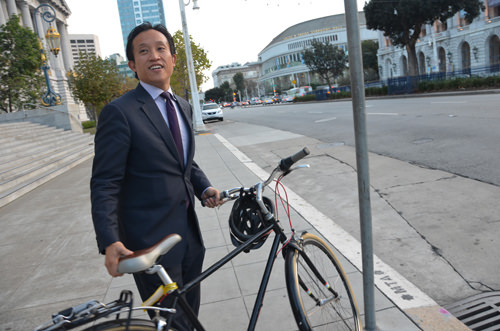 Chiu, until the end of the month, was part of the Asian American power surge in local San Francisco Bay Area politics. He used to work in Washington for the late Senator Paul Simon, (D-IL), a Liberal with a Capital L. Chiu remembers how Simon would go beyond ideological and regional differences to work with congressional colleagues and get things done. Those of you who remember Paul Simon know he wasn’t Garfunkel’s duet mate. He was a guy with glasses who often sported a bow-tie. Moving the ball forward. That’s a far cry from shutting down the government over immigration. Washington could use a few more of those old-fashioned political folks who still believe in working toward real solutions for all of us in America.